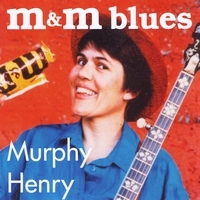 First released in 1993, M & M Blues features Murphy playing her hard-driving, Scruggs-style banjo. As one of Murphy's mail order students said after hearing her play some tunes at a workshop, "Everyone was curious to see if you could really play. You tell us to play clean and clear and get good tone, and everybody wanted to see if you really did that yourself." This CD proves that Murphy can really play! She is ably assisted, as always, by Red with his own powerful, Monroe-style mandolin picking. Three Murphy Method instructors also help out: David McLaughlin on rhythm guitar, Jim Wood on fiddle, and Marshall Wilborn on bass. M & M Blues features 14 selections--13 instrumentals and one singing song, the title cut. The two versions of Leatherjackets, written by Chris Henry, were not on the original cassette. If you like good, solid bluegrass, this CD delivers it in spades. M & M Blues, Hazel Creek, Sally Goodwin, Just Because, What A Friend We Have In Jesus, Little Big Mon, Dear Old Dixie, Salt Creek, Clinch Mountain Backstep, Down Yonder, Sally Ann, Leatherjackets--1994, Leatherjackets--2002.